Veterans Day is an important holiday when we honor the men and women who have fought bravely for our freedom. Not sure how to mark the day? If you’re looking for ways to celebrate the veterans around you, try one of these ideas. Buy from Veterans - Find small businesses in your area owned by veterans and make it a point to shop or eat there. You can even make this a community-wide campaign with a little effort using social media. Visit a VA Hospital - See if your local Veterans Association hospital needs volunteers and head over for the day to help with whatever they need. If they’re already slammed with requests for November 11, pick an alternate day when you can make a difference. Donate to a Worthy Nonprofit - Consider taking the time to make a donation to your local Veterans Affairs or to another nonprofit that helps veterans and their families. While you can donate individually, try to make a greater impact by getting friends and family involved and set a goal. 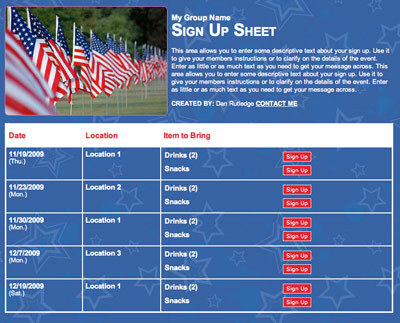 Genius Tip: Learn how a Soldier’s Child serves children of fallen service members by coordinating events with SignUpGenius. Pay It Forward - Offer to pay it forward for the person behind you in line at the store or drive-thru in honor of Veterans Day. Encourage them to do the same by leaving them a simple card with your message of spreading kindness and encouraging others to remember the day. You never know — they might be a veteran! Visit a Retirement Home - You’re almost certain to find veterans in assisted living facilities. Coordinate with staff to throw a celebration in their honor. That could include food and songs or a quiet visit to read to them, talk or play games. Decorate Graves - Go to a local cemetery and decorate graves of deceased veterans with flowers or flags. Make a Care Package - Send care packages overseas to active service members or to your local VA to honor those who serve and have served. Get students or members of your church or community involved by donating items and then holding a packing party. Write to Your Newspaper - Write a letter to the editor about the importance of veterans to your community. Even better: Suggest local veterans who have unique stories that they could highlight for a Veterans Day story. Complete Yardwork - Ask local veteran organizations if any of their members or clients could use help around their homes with yardwork or odd jobs. Organize a group and head over to help them out. Plan a Fundraising Sale - Host a bake sale, lemonade stand or casserole sale and donate all of your earnings to a local nonprofit that benefits veterans. Genius Tip: Earn more money by collecting payments online with a sign up. Attend a Parade - Many cities and towns host some sort of Veterans Day parade. Attend with your family and cheer for those in your area who have fought for your country. Organize an Assembly - If you work at a school, host an assembly to talk about the importance of Veterans Day, including the symbolism and suggestions on how to honor it. Invite local veterans to speak about their experiences. Visit a Local Battlefield - Find a historical site near you, such as a battlefield or armory, and head over for the day to learn more about the history of your city and those who fought for it. Plan a Candlelight Vigil - Organize a local candlelight vigil and invite your community to honor those who have served. Ask veterans or family members of the fallen to share their memories. Visit a Local Memorial - Many cities have memorials commemorating those who fought for the country. Lay some flowers on the memorial to pay your respects. Give a Veterans Day Deal - Own a business? Give a special discount to veterans (or give a bigger discount than you normally do on other days of the year). Want to support as a consumer? Head to stores that give deals to veterans to show your support. Visit a Museum - Go to a museum with your family to learn about our nation’s history and those who fought for it. Attend a Celebration - Your local VA or VFW might host a Veterans Day celebration that you can attend or even volunteer at. Bring the kids along since they’ll be out of school for the day. Organize a Thank You Parade - Gather with friends to make posters and head out to cheer on the side of the road and get people to honk in appreciation for veterans. You never know who it might make smile! Make a Meal - Invite veterans and their families to your church, temple or school for a free meal. Thank them for their service. Hang a Flag - If you’ve never hung a flag in your house or classroom, Veterans Day is a great day to hang one and talk about the meaning and importance of the flag. Talk about the rules of respect for the flag and how to properly retire a worn out one. Do Your Research - Talk to your family members about veterans close to you and what they were like. Go through your family tree and compile a scrapbook to pass down to future generations and note the history of those who have served. Deliver Cookies - Make cookies or treats and deliver them to your local Veterans Affairs hospital or other veteran-focused nonprofit. While you’re there, talk to different veterans about their lives and thank them for their service. Meet a Veteran - Ask people in your group if they have a family member who served in the military or talk to your local VA and have a veteran come to speak about what it’s like to serve in the military. Make sure to thank them for coming! Make Thank You Cards - Send personal thank you notes and cards to your local VA to show your appreciation. This is a great activity to get kids involved with at school or at home. Host a Book Club Discussion - Get friends together around Veterans Day to read a book written by a veteran and talk about what you learned. The hardest part will be narrowing down your selection! Assign a Veteran Research Project - If you’re a teacher, assign your students to create a presentation, report or oral history of a veteran’s life by meeting and interviewing a local veteran or talking to a family member who served. Write a Letter - Write letters to send in appreciation to either a VA or an active service member overseas. Help a Family - If there’s a family in your neighborhood or community with a parent on active duty, invite them over for a meal or organize a meal schedule to thank them. Watch a Documentary - Watch a documentary about a recent or historic war and discuss the issues veterans face. Gather your family or group to discuss what you can do to help those currently facing these struggles. Help our veterans feel appreciated this Veterans Day! Your efforts will go a long way. 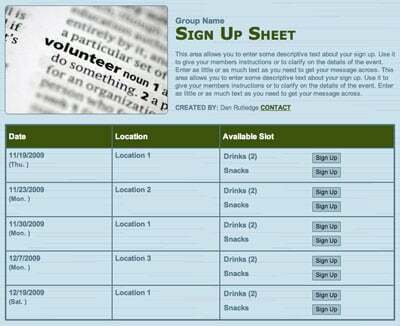 Organize a community service project with an online sign up.